Deere is now in a correction. It is down $9 to $115.00 about an hour into the session. Deere set its all-time intraday high of $132.50 on Aug. 9, and since then was down 12.9% at Friday's open. The shock is that earnings were quite positive, but the trading setup at Thursday's close was a warning. The company reported earnings of $1.97 a share, 2 cents above analysts estimates. The stock could not muster a positive reaction to earnings despite earnings growth of 31.3% year over year. The prospect of a technical downgrade on its weekly chart provided a warning at Thursday's close. 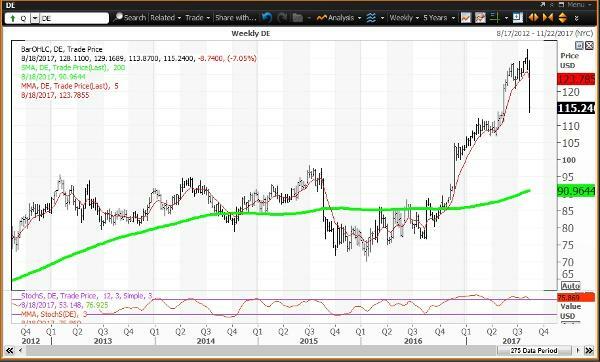 Deere has been above a "golden cross" on its daily chart since May 2, 2016 when the stock closed at $84.29. A "golden cross" occurs when the 50-day simple moving average rises above the 200-day simple moving average indicating the higher prices lie ahead. Thursday's close below its 50-day simple moving average of $126.53 provided a technical warning. Friday the stock is approaching its 200-day simple moving average of $122.22. Deere opened Friday at $115.43, up 12% year to date, and in bull-market territory 30.3% above its post-election low of $88.61 set on Nov. 8. The stock is quickly down 12.9% from its post-election all-time intraday high of $132.50 set on Aug. 9. The weekly chart for Deere ($115.43 on Aug. 18) will be downgraded to negative if the stock ends this week below its five-week modified moving average (in red) at $123.78. The stock is above its 200-week simple moving average (in green) and "reversion to the mean" at $90.96, last tested during the week of Oct. 21 when the average was $85.49. The 12x3x3 weekly slow stochastic reading will end this week below the overbought threshold of 80.00 at 75.87. The stock had been overbought since the week of June 2. Investment strategy: Buy weakness to my quarterly and semiannual value levels of $92.45 and $90.89, respectively. Sell strength to my annual and monthly risky levels of $131.25 and $131.50, respectively. These levels were tested between Aug. 8 and Aug. 10, when the stock set its all-time intraday high of $132.50.